The Young Explorers safari is a specially designed safari which offers families the opportunity to discover the wonders of the African wilderness – together. One of the special attractions of this safari is its exclusivity. 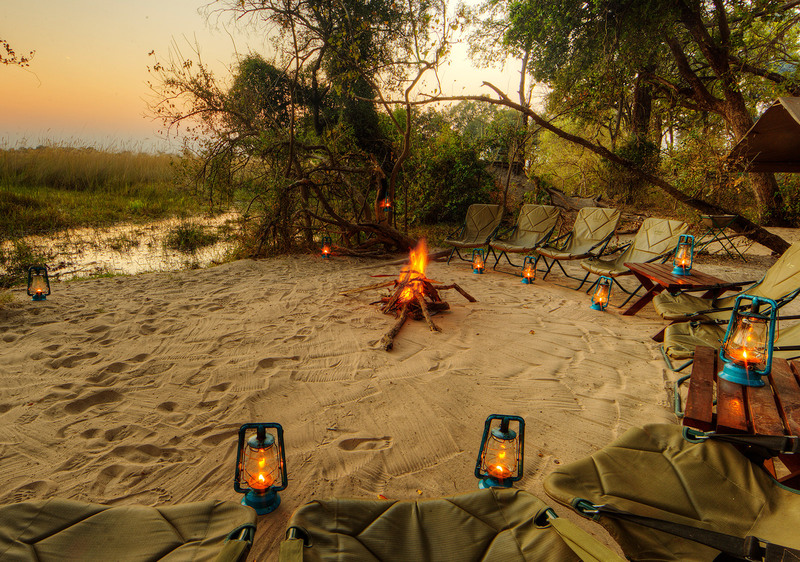 Each family has the use of the Footsteps Camp a private six-bedded camp, a professional guide, personal chef, waiter, housekeeper and dedicated Mokoro guides. It literally allows guests to explore the bush at their leisure, while never losing sight of the fact that being in the wilderness is also about having fun! The Young Explorers family safari is based at the Footsteps Camp within the Shinde private concession This comfortable private camp which accommodates guests in three specially designed, twin-bedded, Meru tents complete with sewn-in floors. One of the three twin bedded tents can be converted into a family unit that sleeps five. Each tent has its own newly refurbished en-suit bathroom including wash basin, porcelain flush toilet and bush shower, even a daily laundry service. The ‘bush kitchen’ is run by our chef and prepares menus to whet all appetites. A selection of activities are planned with the whole family in mind. Parents can enjoy some peace and quiet whilst our expertly trained Young Explorers guide entertains the children with a multitude of activities to suite all ages. Activities are designed to be both educational and inspiring, and the time spent at the Young Explorers camp is sure to leave a lasting impression and fond memories in the minds of all the family. The Young Explorers’ emphasis is on learning how to track game – both on foot and in 4×4 safari vehicles. We also teach children how to make small animal traps and how to start a fire from nothing more than two sticks. 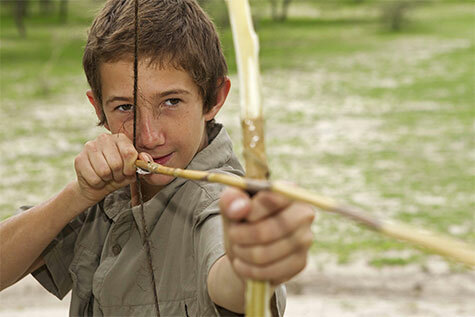 The children learn how to: recognise different animal spoor; identify a range of birds; try their hand at poling a Mokoro (subject to water levels); drive a game drive vehicle; fish; and shoot an air rifle at tin cans. On completion of the safari children receive a Young Explorers certificate, t-shirt and cap. 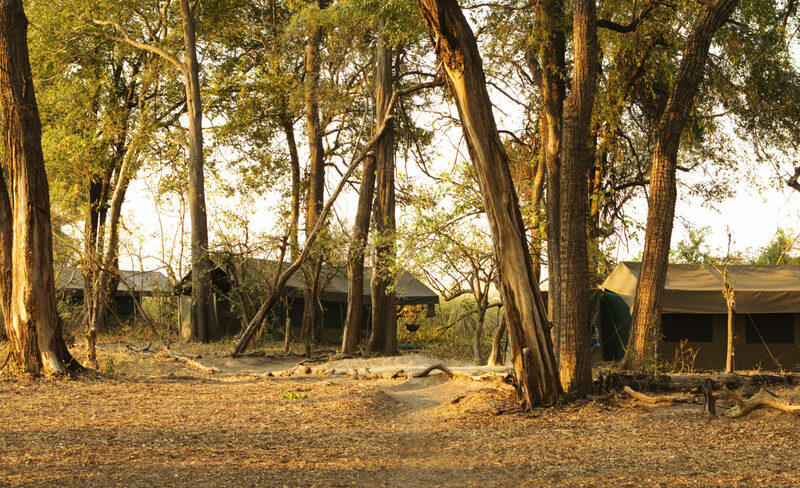 It is possible to upgrade the experience to one of our five-star luxury camps – particularly recommended Shinde Enclave – details on request. On arrival in Maun you will be met by a Ker & Downey representative, then board a light aircraft transfer to the Shinde private concession. The flight is approximately 25 minutes and you will be amazed as the arid Kalahari Desert transforms in minutes into the lush expanse that is the Okavango Delta. Landing at the bush airstrip you are met by your personal guide and continue to camp in an open safari vehicle. The adventure begins as the drive allows you to acclimatise to the bush, while your guide gives you tips on how to spot game animals and birds in the wilderness. 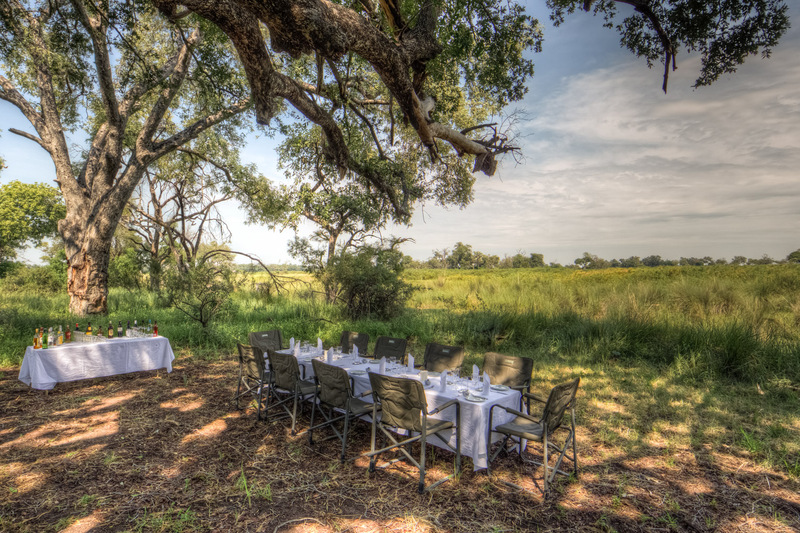 On arrival in your private tented camp, a refreshing drink and light lunch awaits. Over lunch your guide will brief you on safety, and then it is time to settle into camp, while planning your activities with your guide. Later in the afternoon, as the temperatures cool, it is time to begin your introduction to bush craft and some basic rules regarding animal behaviour. One of the most important lessons is to treat all the inhabitants of the wilderness with respect and you will learn that the bush is a safe and fascinating place to be. A short walk from camp allows you to become accustomed to the sights, sounds and smells that make up the language of the African bush. The wilderness is constantly talking to you and your guides will begin to show you some of basics. The more you are aware of what is happening around you, the more you will take away from your adventure! On return to camp, a piping hot bucket shower under the stars awaits, followed by a tasty dinner. Around the campfire we consider the lessons of the day and learn more about Botswana, the history of the country and its people. For those that can stay awake long enough we can view the stars and interesting constellations of the African sky before heading to bed, ready for an early start the following day. The day begins before sunrise with a gentle wakeup call at your tent, piping hot coffee and light breakfast at the fireside, before heading out on foot to see what the bush has in store for us. One of the most amazing aspects of this bush camp is that the direction of a walk or type of activity is entirely up to you and your guide. An interesting track, circling vultures or even the call of a jackal can lead you on an adventure every time you leave camp! Following the water’s edge gives us the chance to examine some of the tracks left overnight, as well as identifying some of the multitude of animals, birds and insects that inhabit the riverine forests. By the end of the walk you should be able to recognise many tracks and have put some of your new bush skills to use. Can you follow a track and find a herd of zebra that passed by earlier that morning? How close can you stalk up to a giraffe? It’s tough with their excellent vision and long necks! Following another delicious lunch prepared on a camp fire, parents are left to a lazy afternoon napping or reading while the younger members of the family are watched over by their guides. Now is a chance to learn some more traditional skills, using the natural products to create jewellery and tools. Using the palm leaves we learn to weave baskets and carve the palm seed, known as plant ivory into a necklace for Mum! Or perhaps try to build your own digging sticks and bow and arrows from the materials available around you? In no time at all, it is time to venture out again, this time it’s a water adventure! 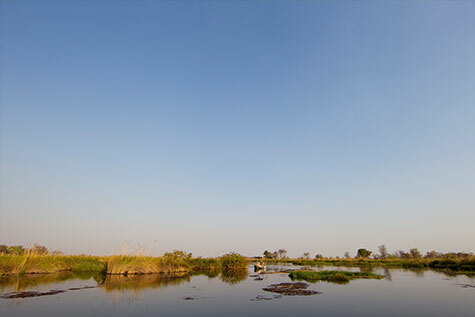 Using the traditional dugout canoe (mokoro), we explore the reed beds and Okavango waterways. Her we learn many skills developed by local people, allowing them to survive in this environment. How do you get a drink of cold water using a water lily stem? If we are especially quiet, we may even spot the sitatunga, one of the world’s most unusual and secretive antelope, which has adapted perfectly to live in aquatic environments. They are capable of hiding underwater leaving only their nostrils above water to breathe! Before dinner this evening, we are off to visit the bush kitchen. You will be astounded as you learn how the mouthwatering fare is produced in camp. There’s no electricity here, all the food, savoury and dessert, fresh bread, cakes are cooked on the campfire or in the steel bush oven! Spend some time with the staff and learn how it is possible to live comfortably in the wilderness without electricity and modern gadgets. It worked well enough for our ancestors after all! With the sunrise comes an introduction to working in the African bush and some of the many tools which we use. Any idea how to drive a 4×4 across a river or through thick sand or mud ? Ever changed a tyre on a 4×4? 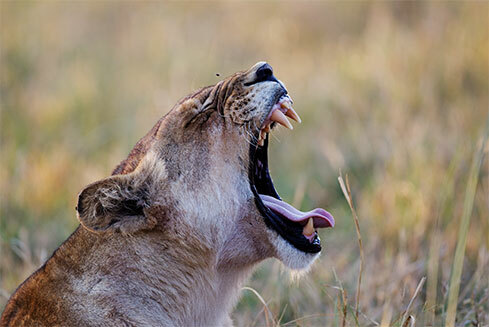 While out and about we are sure to bump into some of the many species of large mammals that inhabit the Okavango Delta including wild dogs, elephants, lion, buffalo, cheetah, wildebeest and impala. Spending time quietly observing these mammals will give you an insight into the structure of their society and how we may understand their moods through their body language. Reading animals’ body language is vital in being able to safely live and move among the other inhabitants of the bush. That afternoon while in camp you will learn some of the rules required in order to handle a rifle safely. This is an important tool in our world and is not a toy and should be respected at all times! Once you understand the safety of handling a firearm, perhaps you can put your new found skills to the test with a pellet gun, on our very own bush range! No doubt Dad will be hanging around for a go as well, and a little family competition usually results! Later, you may wish to try your angling skills Okavango style, either along the banks of lagoons and channels or, for the more adventurous from the Mokoro! Here you will learn how to catch, handle and release a fish correctly, ensuring you do it no harm. We may choose to keep a couple for dinner, in which case be ready to learn how to clean and prepare it yourself! Though the safari draws to an end, the final dinner is still cause for celebration toasting new friends, reminiscing over many unique experiences, many new bush skills and lifelong memories. The grown-ups would like to drift off to sleep with the ever-present chorus of the hippos and the tinkle of the reed frogs. But for the young bush rangers it is the perfect opportunity to head off with a spotlight to try and identify some of the many species that wake up as the sun sets! The morning is spent discussing your stay and your guides will ask you to identify several tracks, birds and animals, and to explain some of the skills that you might use to survive in the bush. After this informal bush evaluation you will then be awarded your Okavango Delta certificate and shirt making you an official member of a truly select group of bushrangers, the Ker & Downey Young Explorers!! After farewells to the camp staff and your guides you transfer by light aircraft onto Maun or your next destination.